My scheduled update is taking too long, so here’s something small but fun to tide you over. 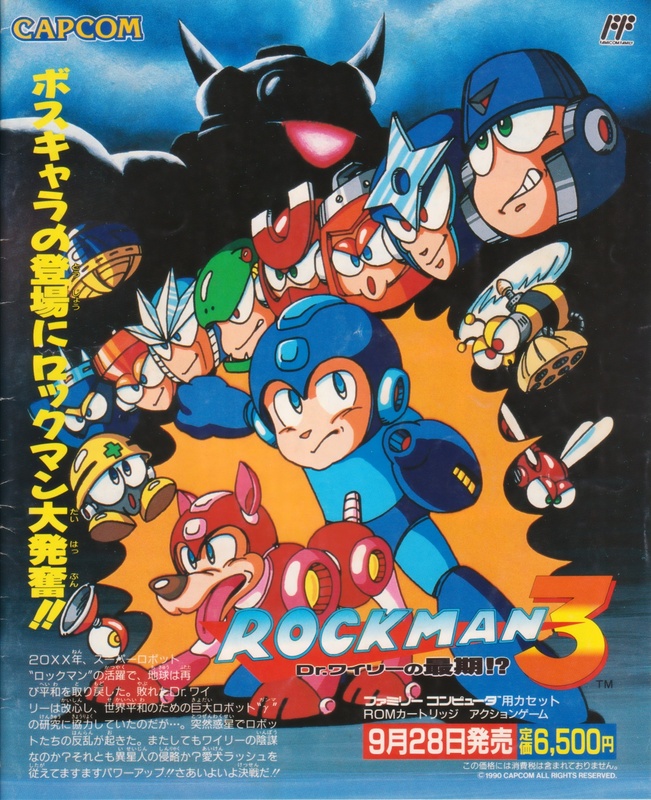 It’s an advert for Rockman 3 that ran in Japanese gaming magazines in 1990. As a point of interest, it actually uses an alternate version of the Japanese box art. 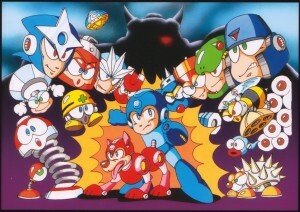 As the boss characters appear, Rockman is ready for them!! 20XX A.D., Peace has returned thanks to the efforts of the super-robot “Rockman”. 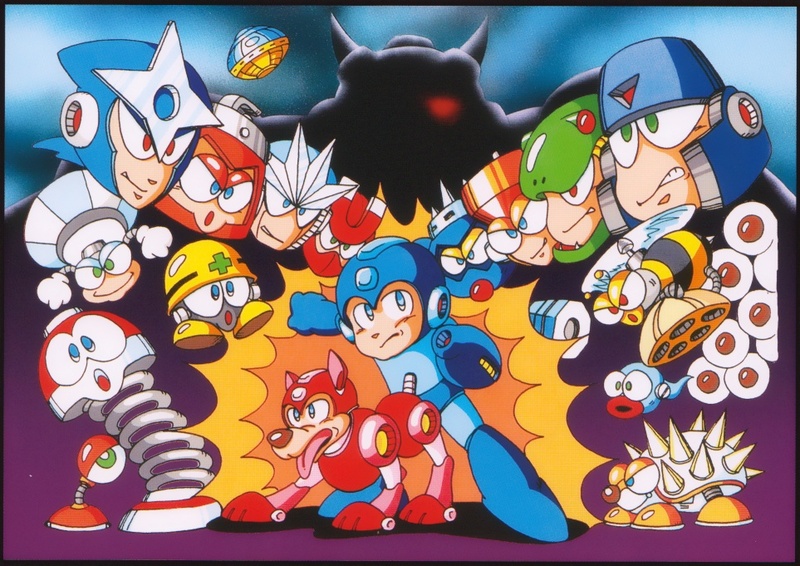 Defeated, Dr. Wily has reformed himself and agreed to cooperate on the development of “GAMMA”, a giant robot for the sake of protecting world peace. Then suddenly… Robot rebellions break out all over the planet! Is Dr. Wily up to his old tricks again? Or is this some sort of alien invasion? 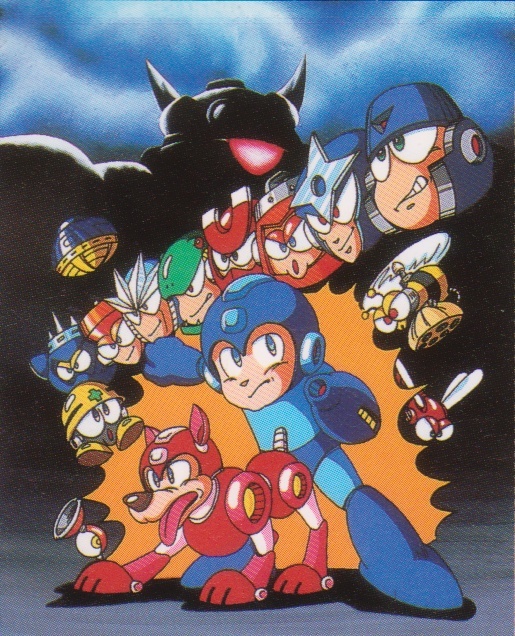 With his trusty dog Rush by his side, Rockman is more powered up than ever!! Get ready for a climactic showdown!! The End of Dr. 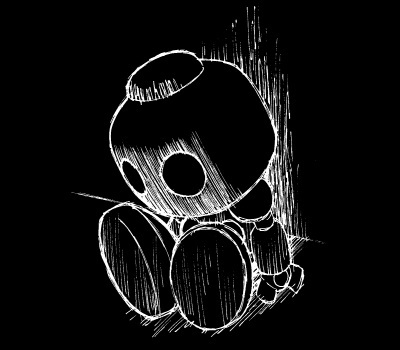 Wily!? This version has quite a few little differences from the final piece. All the bosses’ faces in lined up in the same row. Gamma also looks a little different with his light and shadowing, and different enemy characters are shown. Here’s the same image from Rockman Memories. It’s text-free, but in a much lower quality. Think I like the alternate version better, personally. Too bad it wouldn’t fit properly on a Japanese Famicom box. 6 Comments to "R3’s Alt Ad Art"
I’m gonna sound like a noob, but, I’m betting there’s a LOT of stuff on Memories and Perfect Memories that wasn’t included in R20, yeah? BTW, the Japan ad is going up on the Database as soon as I’m able. Very nice! Cool. In answer to your question, both yes and no! There are way more classic and X series pics in R20 than in either one of those books, but both the Memories books both contain way more story, character and game information. Aside from some mangas, there isn’t much art you’ll find in either book that isn’t also in R20 or one of the other complete works/art books (because they also cover other series like DASH, EXE and Zero). I’d say this Rockman 3 image, and a tiny image of the very first Rockman game manual, are the only two classic series pieces from Memories that don’t appear in some form in R20. Thanks. You saved me some cash with the info. You know, I think what I like about it is that it looks like an 80s animated movie poster. Without the purple backdrop and with fewer bright colors and enemies crammed into the image, the whole thing gives off a darker, perhaps more serious vibe. I much prefer the extra details on Gamma, also. Huh. Gamma in the unused pic has only one eye… hmmm. interesting.